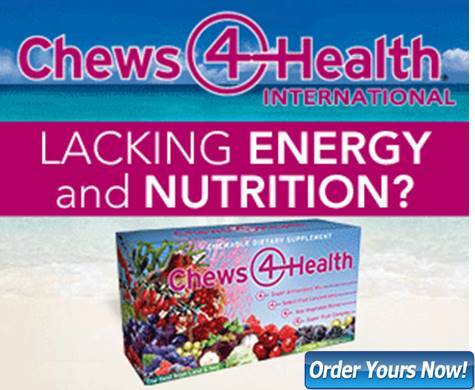 Buy Chews-4-Health Dietary Supplement is Now Only at $29.95. No Coupon Code Needed. Purchase Good-Night All-Natural Sleep Aid is Now Only at $29.95. Buy now! No Coupon Required. Shop IGNITE Chewable Energy Supplement is Now Only at $29.95. Purchase Now! No Coupon Required. Save 15% discount on Good-Night All-Natural Sleep Aid. Use Coupon Code SLEEP at Checkout. "Buy Trimulean Or Ignite (Retail $29.95) And Receive A Second Month's Supply Absolutely Free. Use Coupon Code "Bogo" Limited Offer Order Now! Get 15% Off on IGNITE Chewable Energy Supplement. Use Promo Code TEA during Checkout! Chews 4 health supplements / whole food products are GMO free, gluten free and sugar free, vegan friendly and contains no artificial sweeteners, colors, flavors, preservatives or hydrogenated ingredients. Chews-4-Health will always use the highest quality raw materials, thoroughly inspected for safety, purity, and performance. Good health doesn’t come TO YOU, it comes from WITHIN YOU. The good nutrients you bring to the inside of your body today will determine the health and happiness you will receive on the outside tomorrow. Found a coupon for Chews 4 Health?